You had to see it to believe it. Jimmy Connors had no business playing the 1991 US Open -- never mind going on one of the most improbable runs this game has ever seen. ime doesn't wait. It didn't wait for Bjorn Borg, who first quit tennis at 26, nor did it for John McEnroe, who never won a Grand Slam after age 25. 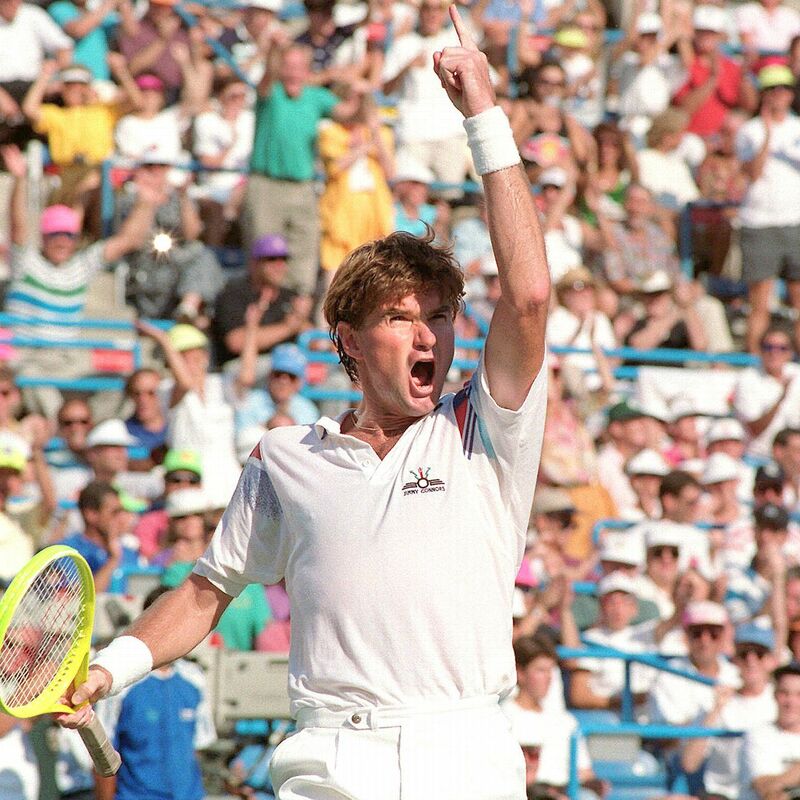 In 1990, a year before his remarkable US Open run, it did not wait for Jimmy Connors, the Open era leader with 109 singles titles. It was the ideal opportunity, at 38, to walk off the stage. By that time, Connors, with all of his crassness, confrontation and class insecurities, had been replaced by a new generation of younger players. Andre Agassi, brash but not mean-spirited, and confident, driven players such as Pete Sampras and Jim Courier were the future of the new game. The Connors era, both in attitude and in the decline of the man himself, was seemingly over. The magic Connors would produce a year later had supposedly already happened. Four years earlier at Wimbledon, Connors, at 34, beat Mikael Pernfors of Sweden. Yet, Connors wasn't done. Not even close. 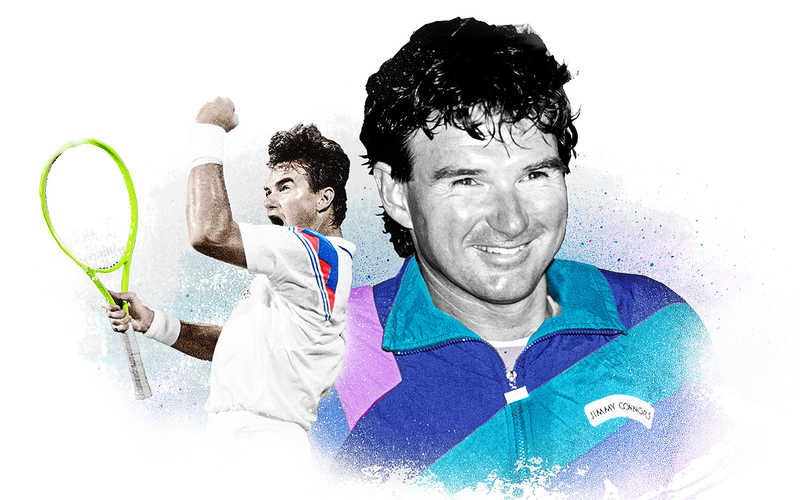 At the age of 39, Jimmy Connors went on a legendary run at the 1991 US Open, where he reached the semifinals in electrifying fashion. Jimmy Connors (1991 US Open semifinalist): "I didn't want to be told to walk away." Joel Drucker (Longtime tennis writer): "In 1990, Connors didn't play the US Open [because of a wrist injury], but he was there. He was on the grounds like he was some sort of exiled CEO, and we left the US Open that night. We drove back in a cab to Manhattan, and as we were leaving Flushing Meadows, he pointed at the stadium, and he said, 'If ever get back there, that place is gonna rock and roll.' "
Mike Lupica: "Connors is down 6-1, 6-1, 4-1. He gets a break and a hold, and I can't remember who I said this to sitting there at center court, but I said, 'He actually thinks he has a chance.' And so he comes back and wins, and that's the day I ran into Billie Jean [King] outside the locker room, and she said, 'When Borg's 50, he's gonna wake up in the middle of the night, and he's gonna say, 'What if?' What if I didn't leave?' "
Peter Bodo (ESPN.com writer): "I never think about him as a lion in winter, more of a jackal. There was something very feral about Jimmy, about the way he played. He always wanted to sink his teeth into you. You sort of imagine him coming out of a match with blood around his lips. I think the one thing you can never take out of the equation is resentment. He always had resentment building in there, toward the establishment, toward other guys -- if one had a better looking girlfriend or a better car, and he felt other people were getting what he should have gotten. The other guys were getting more credit, more than what they deserved. It meant a great deal to him all the time." 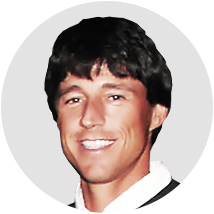 Connors' run began when he accepted a wild-card entry into the 1991 US Open. His world ranking entering the tournament was 174. The first round was Shakespearean. Patrick McEnroe was on court avenging his older brother by putting a world-class beatdown on John McEnroe's greatest, most bitter rival. Patrick was better, cleaner and tougher than Connors, and took the first two sets. After Patrick jumped out to a big lead in the third set, all that was left was to deliver was the final, finishing blow -- a finishing blow that never came. Jimmy Connors: "He was trying to take everything that I had, and I didn't want to give it to him. I was down so far. I was just like, 'Play like you have nothing to lose.' It's amazing. It's like one shot, one noise, one clap, one laugh, one boo can come in a match and turn everything around." 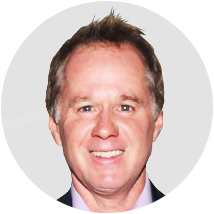 Mike Lupica (New York Daily News writer): "I'd really thought the last chapter of everything that made him great was the Pernfors match in '87, but it was just a preview of coming attractions for the Patrick McEnroe match [at the 1991 US Open]." Patrick McEnroe (former player, ESPN tennis analyst): "Up two sets, love-three, love-40, Connors serving, I said to myself, 'I got him. I got this match. This match is over.' And from that point on, it was over. 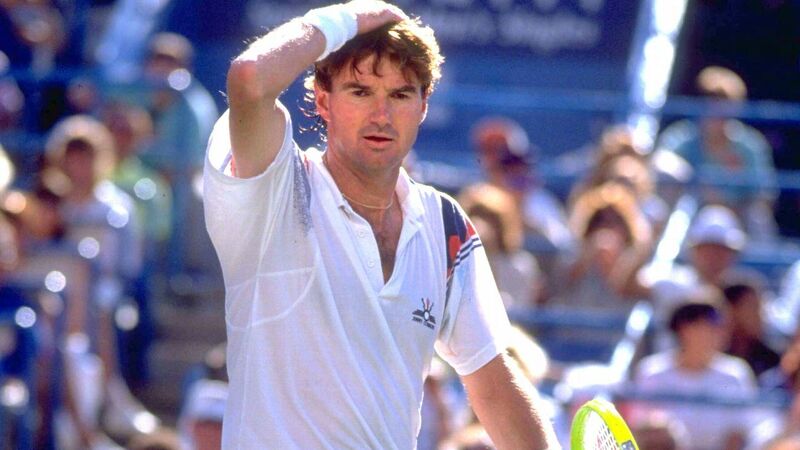 It was over for me, because you can never say that against Jimmy Connors. So that was the kiss of death. I really thought that the match was over, and I knew Jimmy well, obviously through John, but also I practiced a lot with Jimmy. I think he did that in his own way to piss John off." Mary Carillo (former player, Tennis Channel broadcaster): "When Patrick's lead in the third set began to disappear, that was when Jimmy said famously, 'See you in the fifth.' "
Joel Drucker: "Patrick was pretty much running him all over the court, and then you suddenly see Connors serving love-3, 0-40 in the third set. He wins one point, and the whole thing with Connors was that guy could take one point and turn one point into a whole match. He had this way of building positive energy. And poor Patrick. This whole run, all these guys were kind of like the fall guy for the saga, and they had to play the role in the Connors drama." Patrick McEnroe: "I've watched several replays of that match, and I was playing about as well as I could play. The first two sets, and even in the end, in the fifth set, I still felt like I played well. It wasn't like it was such a huge upset. He was 39; I was in my prime. I was 25. I played him again a few months later in Coral Springs, Florida, on red clay, which is now the tournament in Delray. And I beat him like 5 and 5, and, of course, no one cares, nor should they. But the point is we were fairly evenly matched. It wasn't like a shocker that he would beat me, but obviously the way the match transpired made it what it was. The other thing I took away from that match was later in my career I ended up winning a lot of matches from two sets down, so even though people remember me for that match, I still felt like I got something positive from it." Connors cruised through the next two rounds, by beating Dutchman Michiel Schapers (6-2, 6-3, 6-2) and Karel Novacek (6-1, 6-4, 6-3) in straight sets. The draw, meanwhile, had begun to collapse. Aaron Krickstein upset eighth-seeded Andre Agassi in the first round. Seventh-seeded Guy Forget lost the second round, and world No. 1 Boris Becker lost to Paul Haarhuis of the Netherlands in the third. Later on, No. 4 Jim Courier, although the higher seed, beat defending champ Pete Sampras in the quarterfinals. Michiel Schapers (former world No. 25): "I was watching that [McEnroe] match at home, staying with a friend in Long Island. Connors was down 2 sets to love and a break, and it was way past midnight, so I decided to go to bed. The next morning at breakfast, this friend of mine said, 'Jimmy probably won in five, right?' It finished at 2 or 3 in the morning. I had played him before. He was always a tough opponent, of course, and me being a serve-and-volleyer, his best shot was probably his return, so it was always a tough time playing him. He had a really good tournament and he was good against most of us." Karel Novacek (former world No. 8): "Connors was a master of working the crowd to his advantage. That's why he was so difficult to play. He was an amazing player, but at that time he was 39. He was older, so I think after a few games I'm going to be fine, but no, no chance. He was a mean tennis player, and he really did everything to his advantage. When my wife and a few people -- some people in the crowd -- were quiet when I hit good shot, Connors immediately was reacting to that, made a few faces, maybe said something. At first, I had to deal with the atmosphere surrounding the court, which I never experienced. Then I had to worry about his game and the way he was competing and the way he competes. He does everything. He was screaming at my wife; he was screaming at me." Michiel Schapers: "The funny thing, I was 31 myself and I came through qualifying because in '91, I didn't play as much, sometimes you get to a part your life, you get married, buy a house, and in '91 I thought I'd give it another shot, see how far I can go. For me to qualify, win a round, it was already a good effort and to play against Jimmy, I knew it was going to be tough match, but I was quite happy to be back. In '92, I improved to No. 55, so I made sort of a comeback in '91 and '92. For me, it was perfectly OK, playing against one of the legends and he showed he could also beat Karel Novacek, Krickstein, Haarhuis. He tried everything to make a great US Open and he succeeded. It was great for me, great for the public." Now it's Connors' birthday. He's playing fellow American Aaron Krickstein, a kid he had mentored since Krickstein came to his house as a teenager. Jimmy Connors: "Aaron and I were buddies. We trained together. We played gin together. Am I getting criticized because I wasn't friendly, and wasn't friends with everyone that I played against and taking them out to dinner? I had a good friend Ilie Nastase who took me under his wing from the beginning, and because we were such good friends, he beat me 10 times in a row, and I didn't want that to happen again. Some of my best friends, even today, they knew when they walked on the court against me, all the friendship stuff ceased. It was over." Joel Drucker: "I was actually surprised that Krickstein was testing him so much. Down 5-2 in the fifth, one of the most pivotal points in the match is Krickstein serving 5-3 deuce, and he comes to net and Connors throws up a lob, and Krickstein plays it awkwardly. I think it speaks to different skill developments. Krickstein never built as good an all-court game as Connors, and you can see right in that point. He makes his comeback, and he's like a demagogue with the crowd. He's like, 'I'm the law. I'm like Huey Long. I'm the Kingfish.' It's a little cringing at the time to see him. He's chewing out the ump. He's wearing a cross and calling the chair ump an abortion. It was everything Connors wanted tennis to be. It was like a tennis match turned into a football game." Aaron Krickstein (former world No. 6): "Sometimes it still feels like it was yesterday, and other times it feels like it was 25 years ago. It was more than half my life ago. Obviously, it was a difficult defeat, and all tough losses, especially a Grand Slam takes a little bit of time, and you then you have to talk about it. It's part of my history. It's part of tennis history, and maybe it gives people an opportunity to recognize a little bit about my game and who I was." 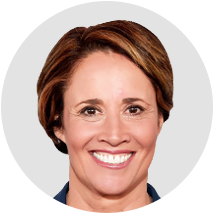 Mary Carillo: "I knew Aaron since he was a baby. Aaron and Jimmy had known each other. That was a rough one to watch because Aaron was way the hell up in the match. Talk about fighting a crowd. Aaron hates that [CBS] used it as a rain-delay match for so long. We finally got him on the air. He finally came to a US Open when CBS still had it and said, 'You know what, it's not easy to watch that.' And he says now, even now, people come up to him and say, 'I was really rooting for you,' and Aaron says, 'I didn't hear you.' He claims the only person in Louis Armstrong rooting for him that day was his father, Herb." 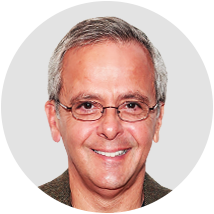 Mike Lupica: "It was incredible. There were 4,000 people in the crowd sounding like 40,000." Aaron Krickstein: "If you had known nothing about me, you'd think that that was the last tennis match I ever played. Jimmy rode off into the sunset, and poor Aaron ended up teaching club teaching. No, I never thought I'd be doing what I do. I never went to college. I only knew tennis since 6. Winning and losing and trying to be the best player that day. Tennis is all I ever cared about. I never thought about life after tennis. Never thought about teaching a 4-year-old or an 80-year-old." Karel Novacek: "I watched the Krickstein match, and I just couldn't believe it. Aaron was very strong mentally, and I could not believe he lost that match. Everything was going his way. He kept calm. He was doing all the right things, but he still couldn't finish him up. That was two guys from the U.S. playing each other, and it still felt like the deciding rubber in a Davis Cup match. Connors was the home guy, and Krickstein was French or something. I told myself this was meant to happen. Connors deserved it. It was icing on the cake for his career." Aaron Krickstein: "It can be tough because you're famous because something bad happened. I didn't play my best at all that day. I had a chance to play Haarhuis, who I had never lost to. I had a chance to get to the final four of a Slam, and you never know what might happen. 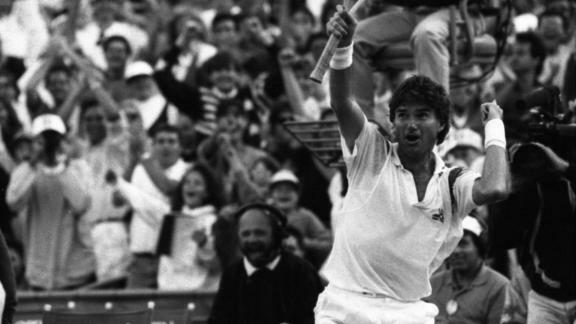 It was an opportunity lost, and it hurt for a long time because it was Jimmy Connors. I often wonder how it would have happened if I had won. But his run just kept gaining momentum. I'm kind of at peace with the fact that I was part of it." After Krickstein, Connors entered the second week of the tournament. A tricky Dutchman, Paul Haarhuis, awaited. He promptly took the first set, before Connors overpowered Haarhuis -- who had already beaten Boris Becker -- over the next three sets. But not before another iconic moment: Connors tossing up four lobs and defending four overhead smashes before finishing one of the greatest points in tennis history with a down-the-line backhand winner. Mike Lupica: "That was the tennis moment. I'm standing there during the Haarhuis match with Nastase, and he turned to me and he said, 'Jimmy's got what we all want.' 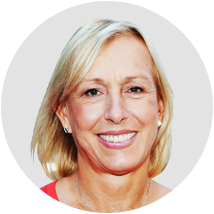 "
Martina Navratilova (18-time Grand Slam winner): "That point was great. It was the talk of the tournament and we were loving it in the women's locker room." 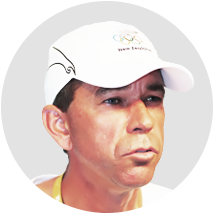 Joel Drucker: "Two years earlier, Haarhuis beat McEnroe at the Open, so he's kind of a spoiler. Haarhuis had a slashing, coming-in game. He won the first set against Connors. What's also overlooked before the point of points, [the famous overhead returns], is Haarhuis is serving for the second set at 30-all, and Connors hits a great return, a vintage Jimbo lunge. And everyone knows it's coming down to this. Can Connors level the set and get back on serve? Haarhuis is just enough of the fall guy, so now they play that great point with all the lobs. What's amazing in the wake of that point is how Haarhuis just capitulated afterward. Did we script this?" Peter Bodo "That comeback was a tribute to his competitive and his fighting spirit, but also to his profound psychological inability to let go." Jimmy Connors: "I don't think this is gonna end. I don't think the fans think it's gonna end, either. They're in it for the duration." 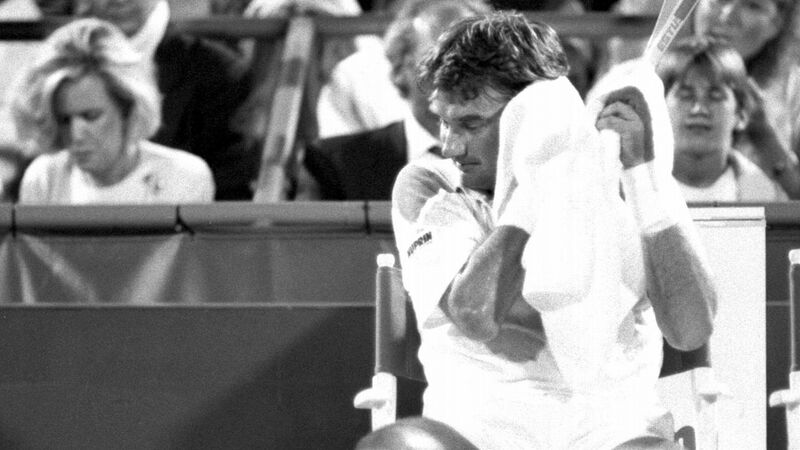 The end for Jimmy Connors was quick, cold and efficient. Courier did not have time for sentimentality. He was a rising star from the Nick Bollettieri Academy who had already won a Grand Slam and would win three more. The Connors story was remarkable, inspiring and historic, but in Courier, Connors was facing a version of what he once was, taking down the older, bigger names in the game. Courier was a player just taking off, hungry to build a reputation for himself, and there was no way he was going to let Jimmy Connors have a day at his expense. 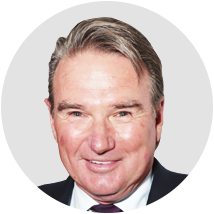 Jimmy Connors: "Where did I get the energy for [this tournament]? I had a debt to pay. I was out for a year. I had reconstructive wrist surgery, and I came back a beginner. I started off as a beginner in tennis once my wrist was out of the cast, and then to get back in and play the tournaments, I was almost treated as a newcomer to the game." 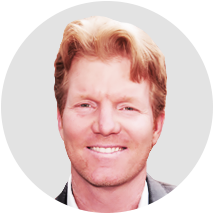 Jim Courier (four-time Grand Slam champion): "The most memorable moment of my career was walking to Louis Armstrong from the indoor center where our locker room was. They would put the rope line up, and you'd walk through this gauntlet of people and it was incredibly intense to walk out there with Jimmy. I felt like I was being thrown to the lions at the Coliseum, because they're all for Jimmy and you're this young American kid. You're not playing Andy Murray at Wimbledon or Gael Monfils or Jo-Wilfried Tsonga at Roland Garros. It's a different deal." 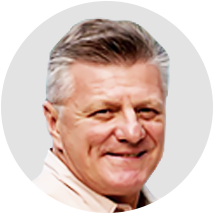 Peter Bodo: "Courier was about the last guy you wanted to run into if you were Jimmy Connors, because Courier was striving to be the No. 1 in the world. He's not going to fall for any of Jimmy Connors' crap. He's not gonna go down gracefully, lose a tight match and praise how great Jimmy Connors is." 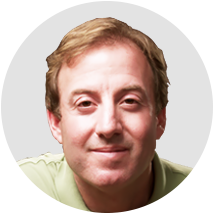 Joel Drucker: "Courier took the measure of it all. He did to Connors what Connors did to Ken Rosewall. Nothing personal. Just business. I love you, Jimmy. We all love you, but I gotta do this, and you would have done the same. Courier knew that Connors was probably tired, knew Connors had played some long, long matches. Courier was 20, Connors was 39. That's a tough go." Jim Courier: "Unequivocally, Jimmy Connors was a better tennis player than me in his career. No one would argue that, and I can tell you that then, and I would tell you that today. The difference in how I played physically versus him made that a good matchup because he wasn't going to get a lot of free points on his serve against me. I had a good record against lefties. I knew I could get into his service games, and I knew I could get more free points on my serve, but what I knew most of all was when we were in the rallies I could probably overpower him over time, and physically I was stronger than he was at that point in his career." Peter Bodo: "I think he was pretty lucky to get guys who were somewhat beatable. First Patrick. 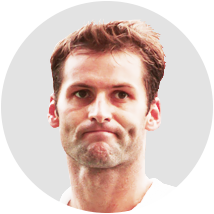 Later, Paul Haarhuis, who was a good player but there was a reason he was great in doubles and not so hot in singles. Then a guy like Krickstein who worshipped Connors as an exceptional in-your-face alpha kind of competitor." Jim Courier: "I remember the handshake. I just felt reverent to him for what he was doing because I was in awe of it like everyone else and probably more because I knew how hard it was. What he was doing was hard in general, and doing it as his age was just breathtaking. So for me, there was a bitter-sweetness to it because I didn't want to be the one who shot Bambi. I didn't want to be the one to kill the dream. I had the perspective of what's going on, but I also had my own little silo of needing to do my job. And I did." Michiel Schapers: "It was an amazing result for him to be in the semifinals. Jimmy was really into it, and when Jimmy really gets into it, he's a force and he showed it those two weeks in '91." Joel Drucker: "I call 1991 a requiem for a heavyweight. That's his last great run. It's The Beatles' last side of "Abbey Road. It's one summation that just in two weeks encapsulates 20 years of a career -- just one fantastic run." Jimmy Connors: "I've said it many times. That was the best 11 days of my career, and I didn't even win the tournament. What that did for those 11 days was it gave me the sound I always wanted and expected from the crowd. They were no longer just 20,000 fans. They were 20,000 crazy fans that wanted to push somebody further than they had ever been pushed before and have them respond. " --Melissa Isaacson contributed to this report. 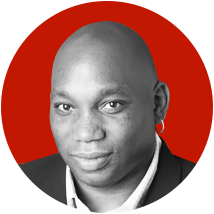 Howard BryantHoward Bryant is a senior writer for ESPN.com and ESPN The Magazine.